So far, no liberal commentator inside or outside government has seriously addressed the central inescapable issue of federal spending: It is unsustainable at current levels. 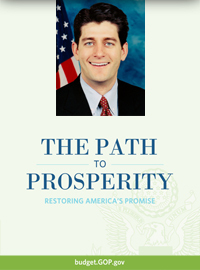 The Left’s denunciation of House Budget Committee Chairman Paul Ryan’s (R-WI) 2012 “Path to Prosperity” budget proposal was swift, but curious. So far, no liberal commentator inside or outside government has seriously addressed the central inescapable issue of federal spending: It is unsustainable at current levels. Add ObamaCare’s implementation to the ledger, and government spending will incur an additional $9.4 trillion increase in the federal deficit within a decade. (As of today, it’s $14 trillion.) So says President Obama’s 2012 budget proposal. You don’t say. Yet the president has said almost nothing about reining in entitlement spending since that unscripted flash of honesty two years ago. Rep. Ryan acknowledges that Medicare and Medicaid are the programs most in need of fundamental change if they are to be saved. That’s why Ryan is pushing a plan to transform Medicare into a voucher program and Medicaid into block grants. Unlike the president, the House Budget Committee Chairman is showing authentic leadership. But nowhere in either document can one find a reference to an American creed of fairness that dresses up government insolvency and higher taxes as examples of shared sacrifice. For the Founders, sacrifice was an action taken in the hope of a better tomorrow. People pledged their lives and sacred honor – with many losing their homes and families in the process – to build a democratic republic free of despotism. In the Age of Obama, “shared sacrifice” isn’t a temporary measure. It is a permanent reduction in the economic opportunity of all Americans. Only an economic vision obsessed with dividing up a shrinking pie could argue that Americans face a (false) choice between illiterate children and stricken seniors on one hand, and tax breaks for fat cats on the other. It is inevitable that any serious, responsible attempt to rein in spending like Paul Ryan’s will take heat from hotheaded liberals – from Van Hollen to Pelosi to Schumer – warning of the apocalypse. It is equally certain that the Left will try to convince Americans that emotion should trump reason when it comes to entitlement programs, exposing the same old tired scare-tactic refrain so beloved by liberals, so destructive to governance. The truth is that a government focused on enabling private sector growth in production is a government able to offer an all-of-the-above approach to social policy. After all, growth in wealth and employment increase economic activity, which in turn increases the tax revenues that liberals love to spend. That’s why Ryan’s plan includes a reduction in income tax rates to 25 percent. Allowing all Americans to keep a greater amount of their paychecks will be the kind of pro-growth signal the market has been waiting to see from government. If Democrats are at all concerned about maintaining some semblance of their pet projects, they should be eager to learn the lesson taught by former Rep. Jack Kemp (R-NY): Give Americans an incentive to produce, and they will work the country back into prosperity. The notion that a rising tide lifts all boats is something Kemp’s former speechwriter Paul Ryan would be happy to share, if only liberals would listen. They won’t. The 2012 budget fight will only get nastier. Good thing fiscal conservatives can count on Paul Ryan’s sensible arguments to beat back the hysterics.